October 27, 2009 -- Dr. Frank Ticheli and Ron Barron are the featured performers in the sixth event of Arkansas State University’s Lecture-Concert Series. Internationally known conductor and pianist Frank Ticheli will be accompanied by a special guest, former principal trombonist of the Boston Pops, Ron Barron, in a concert, “The Music of Frank Ticheli.” Ron Barron will perform Ticheli’s “Concertino,” a concertino for solo trombone and concert band. “The Music of Frank Ticheli” will also include performances by the ASU Choir, the ASU Wind Ensemble, and student/faculty chamber ensembles, as well as by special guest Ron Barron. The concert is Thursday, Nov. 12, at 7:30 p.m. in Riceland Hall, Fowler Center, 201 Olympic Drive. This event, like all events in the Lecture-Concert Series, is free and open to the public. The event is co-sponsored by the Department of Music, ASU Bands, the Society of Composers, Inc. Student Chapter, and a Meet the Composers grant. Review Ticheli's complete concert program online here. Frank Ticheli's music has been described as "optimistic and thoughtful" (LA Times), "lean and muscular" (NY Times), and "brilliantly effective" (Miami Herald). A professor of composition at the University of Southern California, his orchestral works have received considerable recognition, and he is known to be the second most performed composer of music for concert band after John Phillip Sousa. Ticheli received his advanced degrees in composition from the University of Michigan. His works are published by Manhattan Beach, Southern, Hinshaw, and Encore Music, and are recorded on such record labels as Albany, Chandos, Clarion, Klavier, Koch International, and Mark Records. 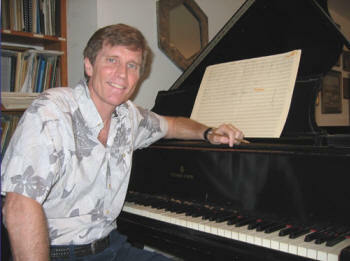 To listen to free downloads of Frank Ticheli’s music, visit http://www.manhattanbeachmusiconline.com/frank_ticheli/html/mp3_ticheli.html. To read a statement from Ticheli, visit http://www.manhattanbeachmusiconline.com/frank_ticheli/index.html. To become a MySpace friend, visit Ticheli’s profile at http://www.myspace.com/frankticheli1. Ron Barr on is a recently retired principal trombonist of the Boston Symphony Orchestra. He joined the orchestra in 1970 and played 13 seasons with the Boston Pops. In 1974, he was awarded the highest prize at the Munich International Competition for trombonists and appeared as a soloist with the Bavarian Radio Orchestra. Equally at home as an orchestral musician and soloist, he has appeared with bands and orchestras and been recitalist in the United States, Europe, and Japan. In addition to numerous recordings with the Boston Symphony and the Boston Pops, he has produced seven solo recordings of standard and new trombone literature. He has been a faculty member for the International Trombone Workshop, the Keystone Brass Institute, and the Rafael Mendez Brass Institute. He has taught at Boston University, the New England Conservatory of Music, and the Tanglewood Music Center. He has also served as a member of the jury for international competitions of Munich and Toulon. For more details, contact Dr. Gil Fowler, associate dean for the Honors College, at (870) 972-2308, or via e-mail at gfowler@astate.edu.The Lecture-Concert Series presents diverse programs to enrich the cultural life of the campus, community, and region. --ASU Public Relations student intern Sara Hulett assisted in the preparation, editing, and online design and formatting of this release.